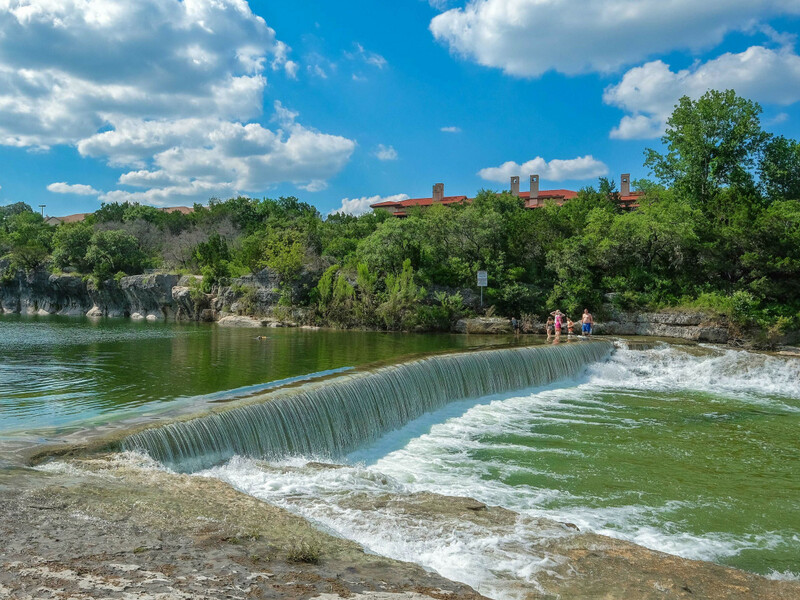 No list of swimming holes would be complete without Barton Springs, the refreshing sanctuary in the heart of Austin. The ice-cold, spring-fed pool (68-70 degrees year-round) is the quintessential spot to take a dip. Night owls, visit between 9-10 pm when admission is free and the pool is less crowded (that means more opportunities to jump off the diving board). 2201 Barton Springs Rd. Closed Thursdays, 9 am-7 pm. $3 adults, $2 ages 12-17, $1 seniors and 11 and under. 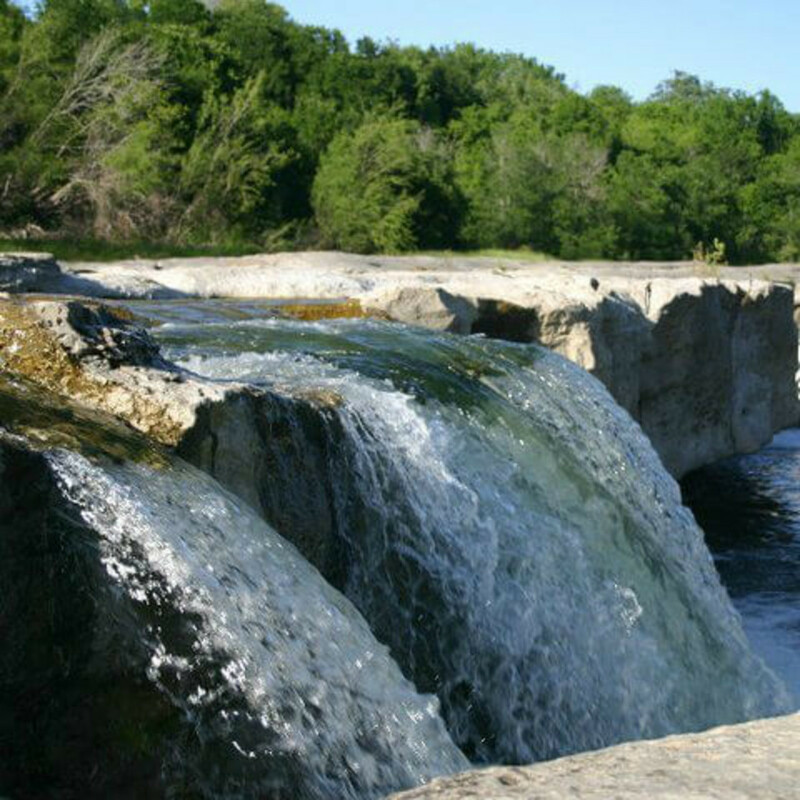 The spring-fed Blanco River, named by the Spanish for its white limestone banks, has been a cherished destination for generations. In addition to swimming, camping, hiking, and fishing are popular activities at this state park. 101 Park Road 23, Blanco. $4 adults, free for 12 and under. 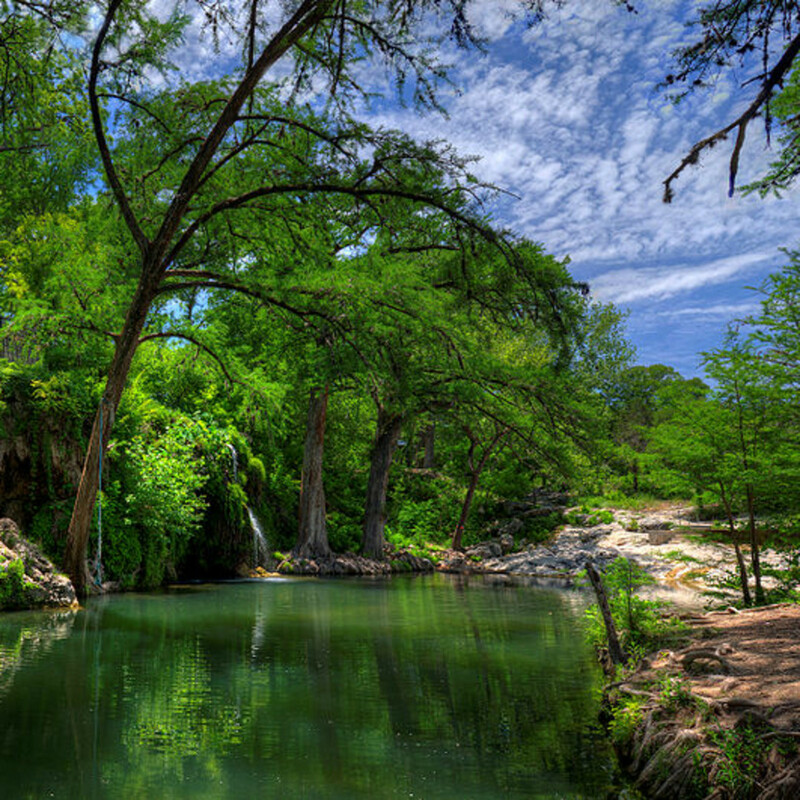 The Blue Hole in Georgetown is a bend in the San Gabriel River just minutes away from the city center. A steep cliff overlooks the warm, deep water and long, rocky banks. This is an ideal spot to set up camp for the day or bring an inflatable raft to lounge along the river. Bring sunscreen and an umbrella, as shade is very limited. West Second and Rock streets, Georgetown. Free. 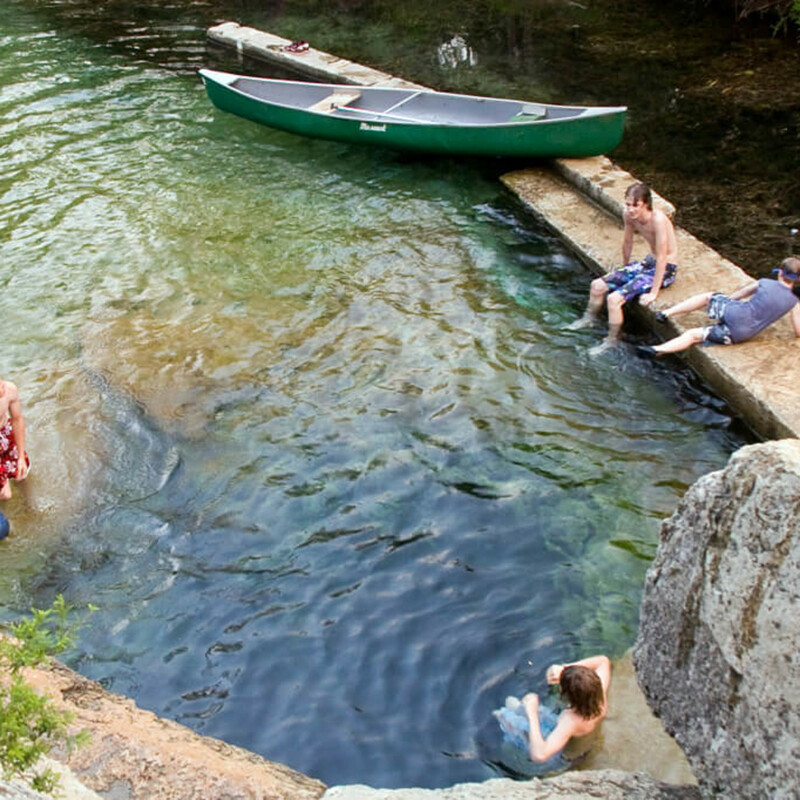 The Blue Hole in Wimberley is a swimmer's delight. This shady oasis offers deep water for swimming or jumping off rope swings, as well as a current that's just right for a lazy float. There's also a large lawn area where kids (and adults) can run around and play. 100 Blue Hole Rd., Wimberley. $9 adults, $5 ages 4-12 and 60-plus, free for 3 and under. This spring-fed body of water has a consistent temperature of 70-72 degrees, even in the thick of summer. 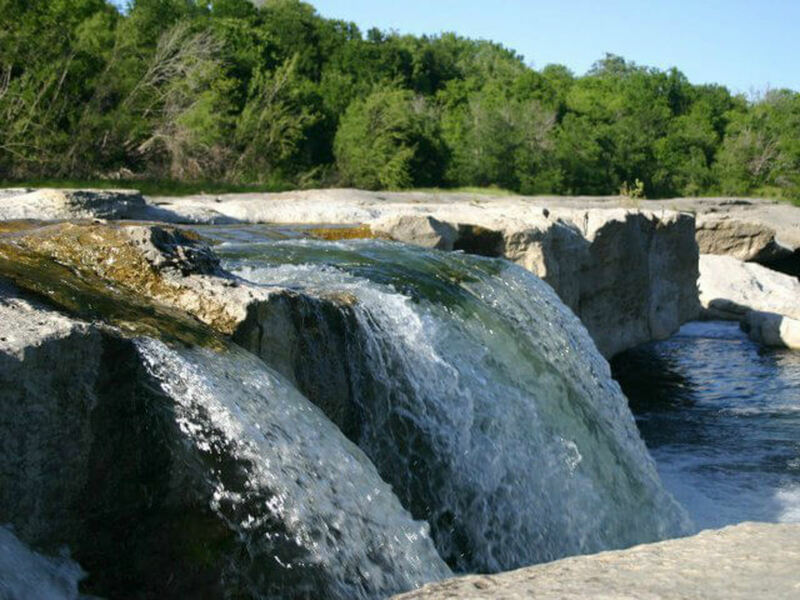 The New Braunfels favorite boasts activities for the whole family, including kayaking and tubing (rental prices vary). For swimming, we suggest Landa Park. Landa Park Dr., New Braunfels. Free. 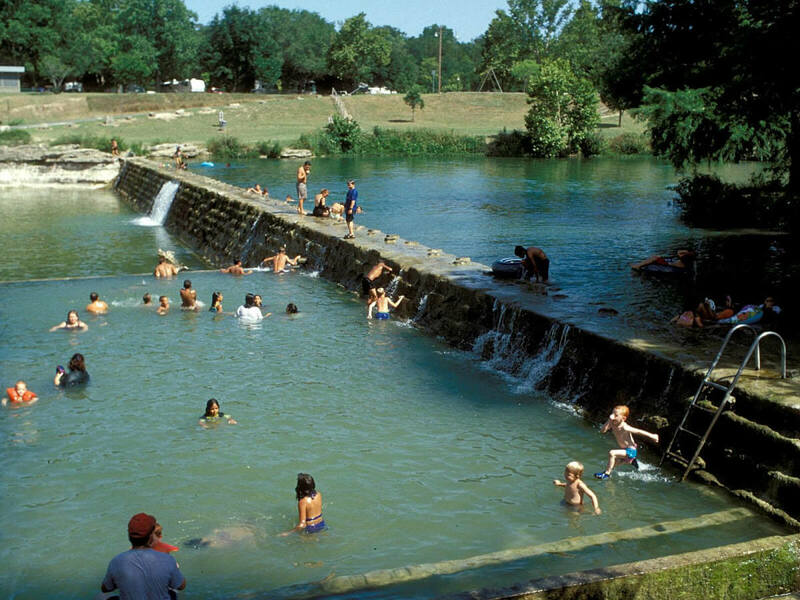 Just around the corner from Barton Springs is Deep Eddy, another spring-fed escape that's breathtakingly cold in the dog days of summer. This popular pool is our top pick for kids and boasts a pool for lap swimming, another for wading, lots of grass for lounging, and a hill for a picnic. 401 Deep Eddy Dr. $3 adults, $2 ages 12-17, $1 seniors and 11 and under. This park is a favorite place to toss in a tube and float. There's also swimming and fishing at this destination, just 30 miles north of downtown San Antonio. 3350 Park Rd. 31, Spring Branch. $7 adults, free for 12 and under. Fifty-foot falls of water cascade over a limestone shelf and into the big, blue-green lagoon. This picturesque spot is so desirable that visitors are now required to reserve a time slot from May 15 through September 30. There's a 10-15 minute hike down to the pool, so pack light. 24300 Hamilton Pool Rd., Dripping Springs. 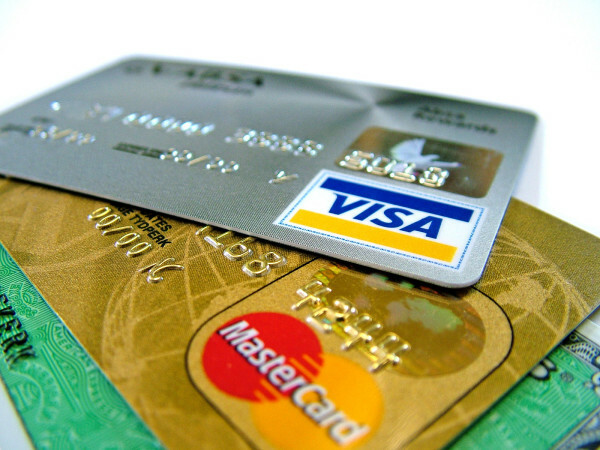 $15-$26 per vehicle. This beach on Lake Travis will force you to leave your inhibitions behind. The only clothing-optional public park in Texas, Hippie Hollow offers 109 acres of beautiful parkland for sunbathing, swimming, and exploring. 7000 Comanche Tr. $15 per vehicle. 18 and up only. 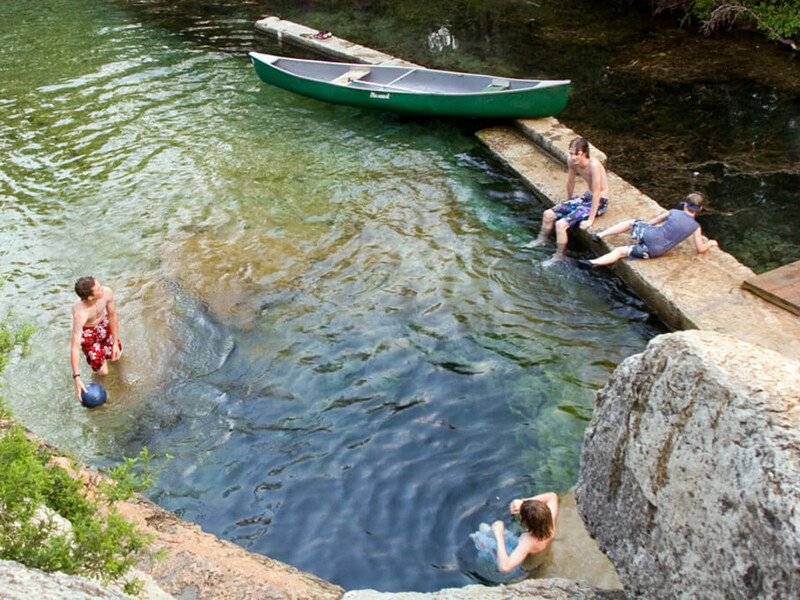 Jacob's Well has some of the clearest and most pristine water around. Like Hamilton Pool, there are admission fees and restricted swimming hours to preserve this popular place. Reserve a two-hour time slot through the Hays County website; only 300 people are allowed per day. 1699 Mount Sharp Rd., Wimberley. $9 adults, $5 ages 5-12, free for 4 and under. Head to Spicewood to experience this Hill Country paradise. There are 32 springs and two pools for swimming, as well as one magical butterfly garden for exploring. If a single day in this enchanting place isn't enough, we suggest camping for a night or two. 404 Krause Spring Rd., Spicewood. $7 adults, $5 ages 4-11, free for 3 and under. 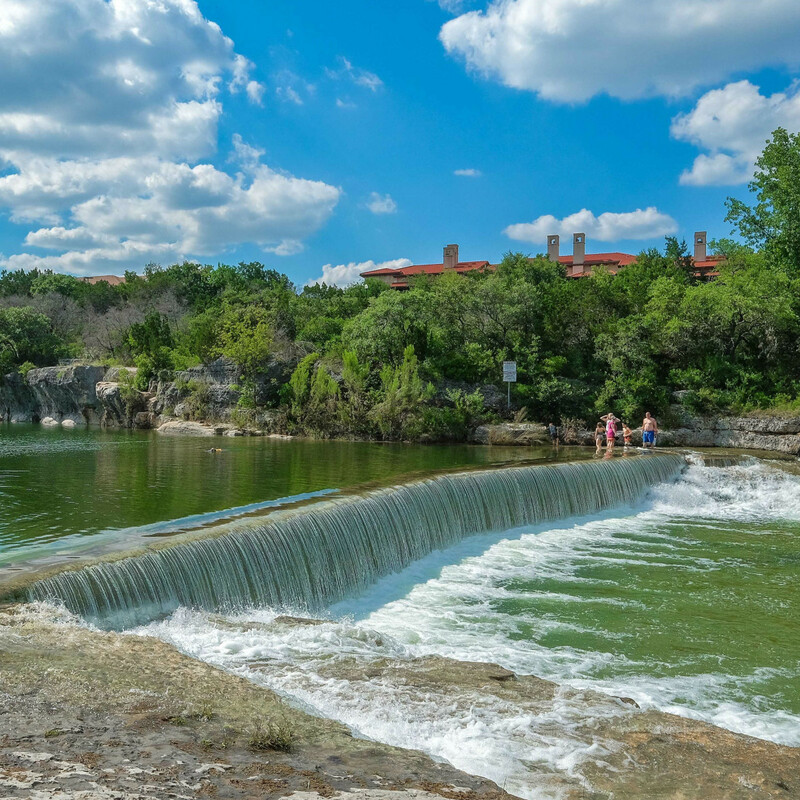 In Southeast Austin, you'll find this amazing spot, named one of America's top swimming holes. Relax in the shallow areas, or scope out places deep enough for a full dip. There are plenty of trails to wander along and a handful of historical sites to visit too. 5808 McKinney Falls Pkwy. $6 adults, free for 13 and under. An exceptional 9 miles of shoreline surrounded by Lake Travis. On the west side of the park you can climb limestone cliffs and explore rocky coves. The north and east sides of the park have the most accessible beaches and swimming areas — we suggest Mudd Cove and Gracy Cove, which are designated swimming-only spots. 2201 N. Pace Bend Rd., Spicewood. $10 per vehicle. The San Marcos River, with its crystal-clear water, is a top spot for tubing, kayaking, swimming, snorkeling, and fishing. The best part? The water temperature is a consistently cool 72 degrees. 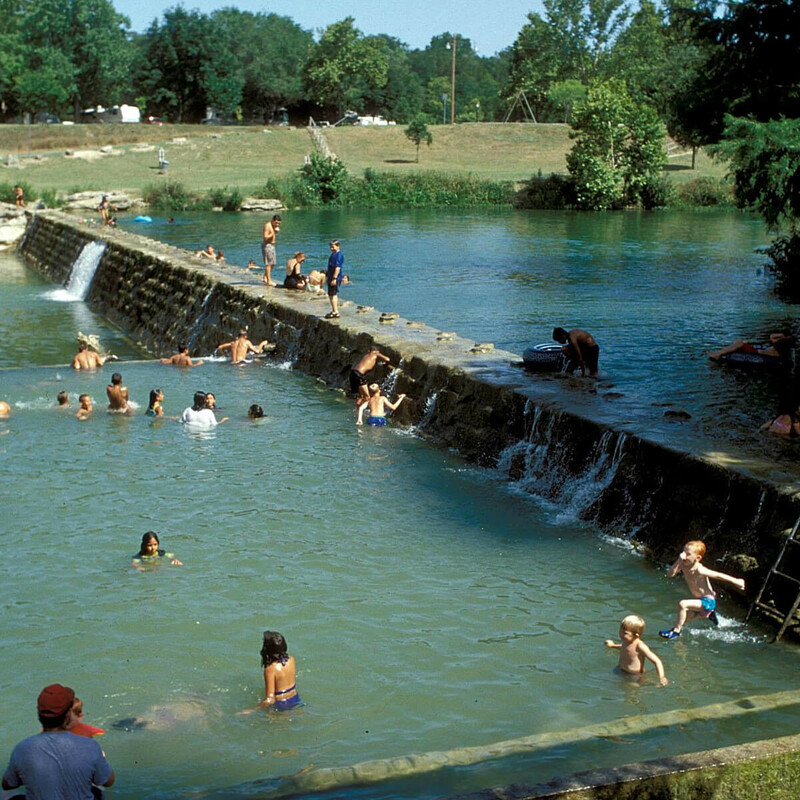 Popular places to take a dip include Rio Vista Park, San Marcos City Park, and the San Marcos Springs. City Park St., San Marcos. Free. 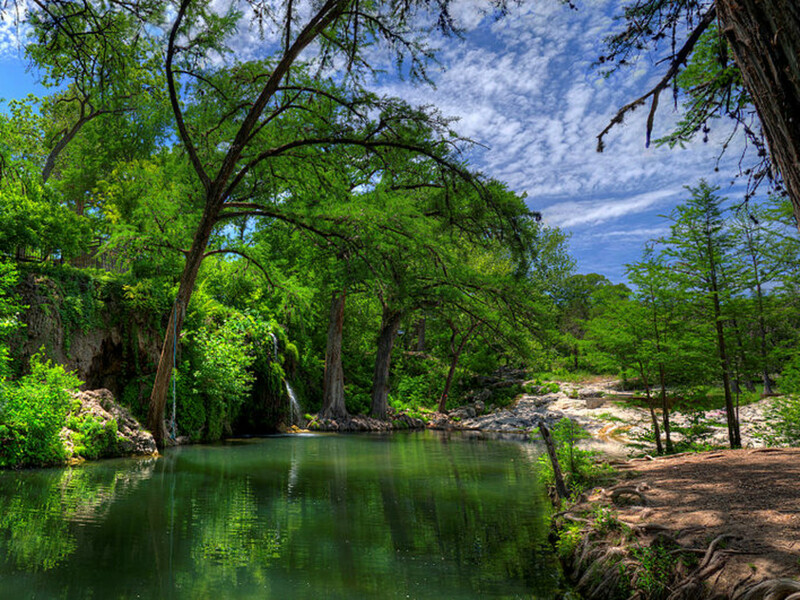 Nestled in San Antonio is San Pedro Springs Park, the second oldest park in the United States. There’s a crisp spring-fed pool for splashing around and swimming, plus a tennis court and scenic trails. 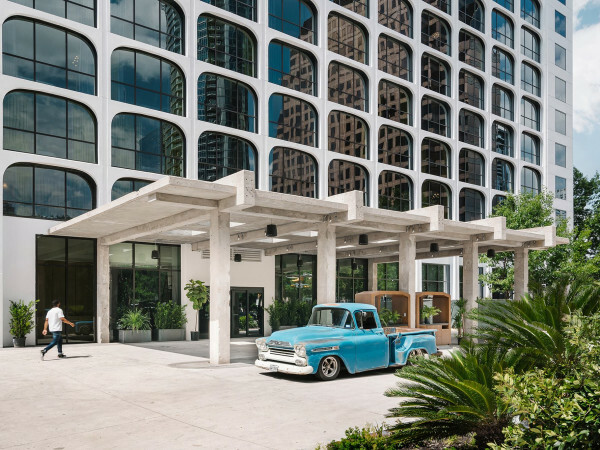 2200 N. Flores St., San Antonio. Open through August 14. Free.